ILead Training Workshop is VietAbroader’s newly launched leadership-training workshops for Vietnamese high school students. We will be organizing several leadership panels, inviting different guest speakers, and putting together engaging challenges to empower Vietnamese youths with essential leadership traits and self-confidence. By exposing Vietnamese high school students to enriching opportunities to polish their leadership and other essential soft skills, ILead aims to motivate the young generation to push themselves harder, step out of their comfort zone and get more involved in community as real social change agents. • Provide hands-on experience and trainings for youths to develop and improve their critical project planning, service, and leadership skills. • Create a support network to effectively connect and assist future Vietnamese young leaders in their endeavors of taking initiatives and making social impact. • Cover a wide range of topics on leadership training, from practical skills like teamwork, communications, public speaking skills to emotional intelligence qualities like self-regulation, empathy or self-awareness. • Create a long-lasting impact on participants, as they will have the immediate chance to apply what they have learned from ILead leadership training series by entering a post-series challenge. The competition requires the participants to come up with their own proposal of a community involvement project. The winning proposal will be awarded a grant from VietAbroader to be put into reality. More and more young people in Vietnam become aware of the need to play an active role in contributing to society and take action for causes they care about. However, to initiate an idea in Vietnam is not an easy thing, as various restrictions and lack of resources present significant barriers to making things come true. By offering a source of funding and guidance throughout the project, VietAbroader Community Grant aims to alleviate those discouraging elements and creates a push for social innovation as well as Vietnamese youth empowerment. 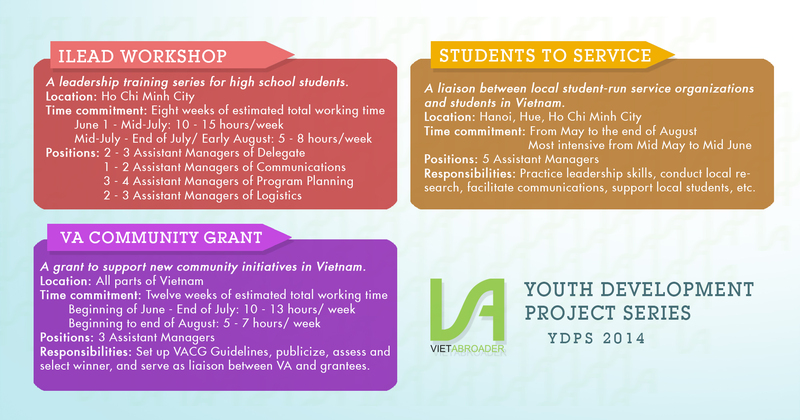 Following the success of VACG’s projects last year, this summer VACG continues its mission of empowering Vietnamese youth to play an active and meaningful role in the development of the country. By providing a source of financial support and professional guidance to new project initiatives, VACG seeks to give Vietnamese students real opportunities to enact positive changes, contribute to the common good and, from that, develop their leadership and project management skills. Tentative time: Information about application for VACG will be posted in late June. Student to Service Project serves as a liaison between local student-run service organizations and high school and college students in Vietnam. This initiative was launched with a mission of motivating and providing resources for Vietnamese students to get more involved in the community, to be more proactive, and to become the leaders of tomorrow. The project seeks to form partnerships and connect students interested to local student run service projects (such as Bup Sen Hong, Project Sugar), where they collaborate with other youths in the community to make a difference while enhance their leadership skills and build life-long friendships. As a member of the organizing team, you will gain more experiences with professional communications, become more exposed and knowledgeable about various opportunities to get involved in the community, and become the agent of change for the future of Vietnamese youths. Cover a wide range of topics on leadership training, from practical skills like teamwork, communications, public speaking skills to emotional intelligence qualities like self-regulation, empathy or self-awareness. Create a long-lasting impact on participants, as they will have the immediate chance to apply what they have learned from ILead leadership training series by entering a post-series challenge. The competition requires the participants to come up with their own proposal of a community involvement project. The winning proposal will be awarded a grant from VietAbroader to be put into reality.